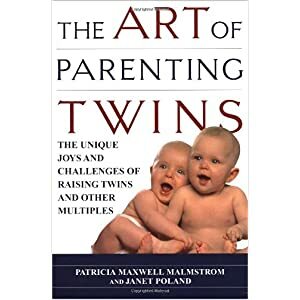 The Art of Parenting Twins: The Unique Joys and Challenges of Raising Twins and Other Multiples by Patricia Maxwell Malmstrom and Janet Poland. I've quoted from this book in two previous posts, so you know I found it thought-provoking. In fact, it has a lot of good information. And yet... I find enough about this book off-putting that I can't give it a whole-hearted recommendation. For example, the author (who refers to herself in the first person singular, even though there are two listed on the cover) rejects the terms "identical twin" and "fraternal twin". Why? Well, "identical twins" aren't completely identical, and "fraternal twins" aren't necessarily brothers. Accurate, but tedious. Don't get me wrong -- I like the terms "monozygotic" and "dizygotic" as much as the next parent, but there's no need to get strident about it. Other annoyances -- use of the term "co-twin" instead of "twin" and frequent references to "Twin Services", an organization she runs. I know that organization is the source of much of the practical advice in the book, but it feels like an advertisement. But it's awkward to refer to "twins and higher-order multiples" throughout the book, so we'll use the term twins to refer to all multiples. Why did I find this irritating? Because after that, there are repeated references to triplets sprinkled throughout the book. If you're going to go to the trouble of saying you'll call everybody twins, it's really jarring to read the triplet references. I'll think, "Do I really need to read this part? ", "Shouldn't parents of triplets get their own books? ", and "Twins don't seem so bad by comparison." Most memorable response to a stranger's question: this time the response comes from a twin himself. "If someone says, 'Are you twins?' I'll say, 'I am, but he's not.'" Parents of twins can adapt this to, "One of them is identical, and the other's fraternal, but I can never remember which is which." All in all, there's solid information contained in this book, if you can get past the style. I couldn't, which is why the Twinometer is stuck at 7/10. Just thought of another rapid-response to nosy strangers. A: No, I'm not a twin. Whatever made you think so?